This unusual, one of a kind, high fashions double pendant will match most any wardrobe color and surely make that outfit pop. 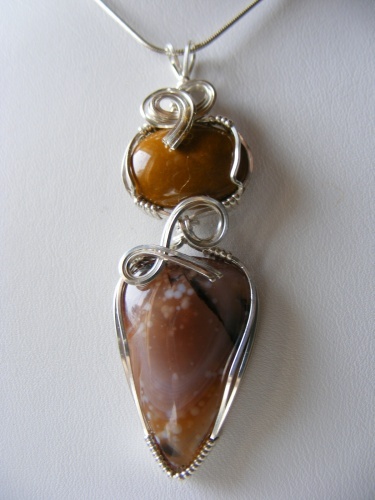 The bottom gemstone is jasper and the accentuating gemstone is an amber jade stone all sculpted in sterling silver curls. Piece measures 2 3/4" long including the bail and 3/4" wide at its widest part. Comes with a sterling silver snake chain.